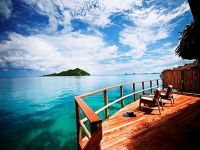 Located on Fiji’s northern island of Vanua Levu, this Fiji Resort offers 5 star, deluxe Namale Fiji Island Resort & Spa with 14 private bures and 2 villas, offers uncompromising service, accommodations and cuisine. During your stay, all meals are included as well as all beverages including spirits, fine wines & French Champagne.This magical South Pacific island is unspoiled by time and commerce yet affords you the elegance and luxury you seek. This Fiji resort features 2 freshwater swimming pools, 2 jacuzzis, snorkeling, sailing, water-skiing, windsurfing, horseback riding, ten-pin bowling, virtual golf, putting green, hiking, visits to the Fijian village, and more.The new 5,000 sq. foot spa situated on a cliff top overlooks the ocean with walls of glass offering panoramic views of the Koro Sea. Fiji resorts offers miles of empty white beaches, acres of rainforest, fields of yellow grasses planted by the wind, and a horizon of sapphire sea that traces the curve of the earth’s edge form this five-hundred acre (two-hundred hectare) island of unspoiled tropical beauty shared by only fourteen fortunate couples. Approaching Turtle Island by seaplane, you pass over jagged volcanic islands and ancient lagoons to an exotic and romantic destination in the South Pacific. This is your own private Island to enjoy, and its magic will astound you. Take time with your partner to connect, and explore the wonderful environment Fiji provides you: pristine reefs, white beaches, lush forest and diverse wildlife.Friendly Fijian staff will greet you by name and you will immediately feel special as you experience their warmth, hospitality and wonderful traditions. The choice is yours to relax in a hammock, on one of the 14 separate beaches, in your own stunning two-room bure or participate in a variety of water and nature based activities. Set by a magnificent three-quarter mile white beach, on an island surrounded by colorful coral reefs, all-inclusive Vatulele Island Resort is a luxury escape only Fiji dreams are made of. In keeping with the owners’ philosophy of ‘providing an escape from the western world’ there is a strictly limited number of guests (18 couples only). There are no phones, faxes, televisions, or money transactions available on the Island, ensuring a truly relaxing experience. Vatulele Island is located south of the mainland of Viti Levu. This Fiji Resorts location is situated on the western side of the Island, comprising 85 acres, and boasting a unique architectural style. Access to limestone cliffs, caves and Fiji’s sacred sites enhances the Island’s tropical mystique. Yasawa Island Resort in Fiji is located in the splendid isolation of the unspoiled reaches of the Fijian Yasawa archipelago. Tucked among the palms on the remote island are just 16 thatched-roof Deluxe Bures offering complete solitude and absolute luxury. There are no other resorts, television and outside intrusions, just the whisper of the waves and sea breeze. Your spacious Deluxe Beachfront Bure offers air-conditioning, ceiling fans and large sundecks. All meals and non-alcoholic beverages are included in your stay. Discover your own paradise – take a picnic lunch to one of eleven deserted beaches, sail a catamaran, visit the local villages or succumb to a massage. 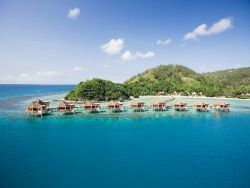 Nestling in the Mamanuca Island chain in Fiji and surrounded by crystal clear water, lies Tokoriki Island Resort. With a beautiful white sand beach, breath-taking coral gardens and a sparkling lagoon, the resorts offers a romantic choice for the discerning traveler. 29 Bures dot the shore on the western part of the island, sunsets are always at the optimum. Your Deluxe Beach Bure hugs the shoreline with direct access to the beach. Relax on your own private verandah, take a plunge in the fresh water swimming pool, snorkel among the tropical reefs just off the beach in front of your bure. The PADI Dive Center at the resorts location can take you to the best dive spots in the Mamanuca Islands. One of Fiji resorts that offer an intimate small luxury boutique resort on Qamea Island in the northern islands of Fiji, Qamea Resort & Spa features only 12 oceanfront air-conditioned bures and a spectacular 1 mile private white sand beach and is located near some of the best dive reefs in the world. Built in traditional Fijian style, each Beachfront Bure is placed for maximum seclusion and privacy. Exquisite attention to detail ensures your every whim and need. From the cool Egyptian cotton sheets to the gently swaying hammock, indulge in a carefree existence of tropical splendor. The Honeymoon Villa is stunning as it spans over 1,200 square feet of luxurious celebration. With a private outdoor Jacuzzi, guests can sit under the stars and experience the awesome beauty of the South Pacific. The Premium Villas is also built for maximum privacy at the far end of the white sandy beach. The 1,600 square foot villas come complete with private outdoor pools and spectacular views across the lagoon. With a sweeping view of the ocean and sunsets, the Qamea resort is the perfect destination for travelers seeking an authentic Fiji experience. In the middle of the Mamanuca archipelago, Fiji’s newest luxury escape resort, the Likuliku Lagoon Resort is a haven of relaxed refinement whilst capturing the essence of Fiji. Reflecting in Melanesian architecture as well as the warmth of the friendly Fiji hospitality, couples may recapture the essence of their romantic spirit and their individual sense of serenity. This Fiji resorts 10 private Overwater Bures that are located on the edge of the coral reef, 18 Deluxe Beachfront Bures with individual private plunge pools and 18 Beachfront Bures that are only steps away from the beach. The personal cabana retreat with daybed for the Beachfront Bures is perfect for any couple that wants to relax and enjoy the beauty of the lagoon. Before dining, enjoy evening cocktails in the Lounge Bar or at the beach bar on Masima (Salt) Island before sitting down to dine in the intimate signature restaurant – “Fijiana”. Dine indoors, al fresco on the terrace or beachside, or perhaps a candlelit dinner in the wine cellar. Menus feature modern Pacific Rim and traditional Fijian influences. Activities include bush walks leading to spectacular views of the Mamanuca Islands, guided snorkeling adventures, parasailing, windsurfing, and game fishing, and diving. Rejuvenate or relax at the Day Spa and gym or shop at the boutique that specializes in traditional and unique fashion and accessories. 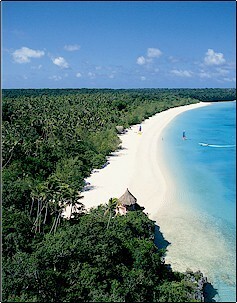 Royal Davui is on a remote lush island atop a living reef, fringed by white sand beaches and a sapphire lagoon. A romantic Fiji island retreat where a priviledged few can enjoy the solitude of a secluded island in total luxury and comfort, the resorts 16 villas are situated to ensure privacy. Each offers dramatic views of Beqa Lagoon and features mahogany floors, thatched roof, walls of glass, two decks, and an infinity plunge pool. Dine on first-class cuisine at the resort’s Banyan restaurant, overlooking the lagoon. This Fiji resorts menu is Pacific Rim, inspired by local fresh fruit, vegetables and seafood as well as the finest of meats. Activities include catamaran, sea kayaks, hiking on Beqa Island, snorkeling, gourmet beach picnics, and cultural village visits Scuba diving and spa treatments are also available. All meals and non-alcoholic beverages are included. 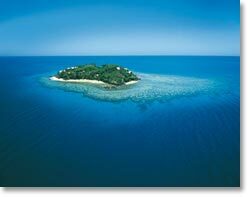 Mamanuca Islands of Fiji, Castaway Island Resort is one of the most popular of Fiji’s resorts. 66 spacious thatched-roof bures with private verandahs, a freshwater pool, tennis court and a boutique are spread out among the resorts 174-acres of lush tropical gardens and pristine white sand beaches. This Fiji resorts offer an array of activities for everyone, from an acclaimed PADI (Gold Palm 5-star) dive center to a complimentary Kids Club. Whether a romantic getaway or a family vacation, Castaway Island Resort has it all- superb warm hospitality in a casual yet luxurious environment. One of the finest of Fiji’s resorts, the Outrigger on the Lagoon is a full-service resort located on Fiji’s famed Coral Coast. 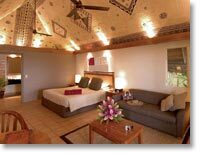 Only an hour’s drive from the Nadi airport, the resort combines modern architecture with traditional Fijian culture. Built to resemble a Fijian village, the Outrigger on the Lagoon features 207 ocean-view rooms and 47 bures on its 40-acres of tropical gardens as well as one of the largest freshwater pools in the South Pacific, three restaurants, a fitness center, and lighted tennis courts. Located on Fiji’s Adventure Island, Taveuni, the resorts 21 Bures stretches across 88 acres of tropical plantation with hilltop sunset gardens and white sandy beaches. Explore, enjoy and simply release yourself to the tranquil days and nights, basking in the pure indulgence of time and warm-hearted Fijian hospitality. Where the rainforest meets the reef, rejuvenation begins upon arrival. Escape from the ordinary. 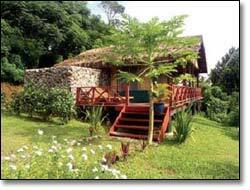 Beautiful tropical setting with well appointed Bures offers easy access to fascinating jungle and waterfall hikes. It’s a timeless and idyllic setting for creating the memories of a lifetime. 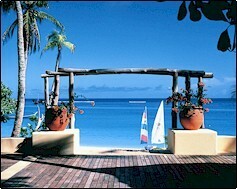 Maravu prides itself on providing innovative Island Cuisine. Meal plans include a full-cooked breakfast, three-course lunch (or gourmet packed picnic), and a three-course dinner. Private candlelit dining is available. Maravu resorts features one of Fiji’s largest and finest wine cellars, with regional South Pacific as well as American and European wine & champagne. Maravu boasts many exciting complimentary activities including horseback riding, mountain biking, sea kayaking, snorkeling, guided hiking and Fijian Cultural Activities. Facilities include a swimming pool, full service spa, activities/tour desk, full bar & lounge, private white sand beach, air-conditioned gym and activity equipment. Maravu boasts of its full-service spa facility that is set amongst the tropical gardens. The spa utilizes pure Fiji locally produced beauty products. 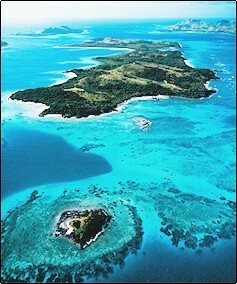 The ultimate South Seas experience, Blue Lagoon Cruises sails through some of the most scenic islands in the world. Exploring the idyllic waters and reefs of the Yasawa and Mamanuca Islands in Fiji, these luxury yachts offer intimacy and comfort, accompanying only 40-70 passengers on each of its vessels as well as various itineraries to maximize availability and schedules for its clients. Sailing an average of only 4 hours a day, the cruise allows guests to lounge in their spacious air-conditioned cabins, dine on fine gourmet cuisine and wine, discover the beauty of Fiji and its villages, all in a relaxed pace and atmosphere. The Blue Lagoon Cruise is truly the ultimate Fijian vacation.